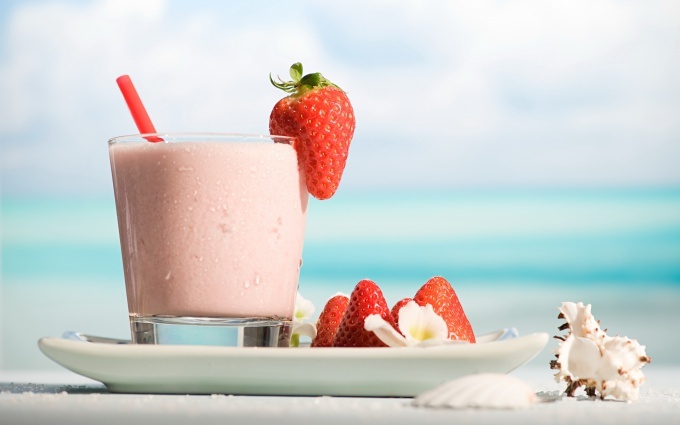 Refreshing and nutritious milkshake is a something between a dessert and a drink. The recipe is very simple. Replacing the strawberries for a banana or cherries you can diversify cocktails. Also, instead of fresh fruits and berries you can use fruit and berry syrups. Using chocolate syrup - you get a chocolate milkshake. Strawberry peel from the peduncle. Rinse berries and dry on a paper towel. Lay the strawberries in a blender and grind to puree. Join strawberry puree ice cream. Stir in the milk and whisk at high speed for 3 minutes. The finished cocktail pour into glasses and garnish with strawberries. Decorate a cocktail can not only berries, but also whipped cream and sprinkle with grated chocolate. Milk can replace cream. And ice cream - any milk or cream ice cream.